If you're not getting enough results, try new keywords. Unless you need an article immediately, don't check "full text"
In an individual education database, you can use OR to include similar/synonym keywords in the same search box to increase the number of results you receive. Please note, OR does not currently work well in Search@CULibraries, and searches are more effective when only one keyword concept is included in each search box. Select the main concepts in your topic to use as your key concepts. 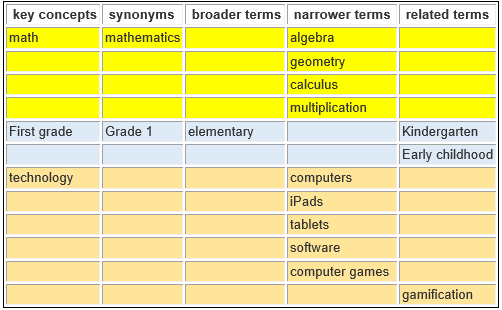 Then brainstorm synonyms, broader and narrower terms, and related terms. Example 1: What is the effect of using technology to teach math to first grade students? Example 2: How do you increase third graders’ comprehension of informational texts? The tutorial below provides more examples. Brainstorming Keywords: Tutorial. Running time: 2 minutes.